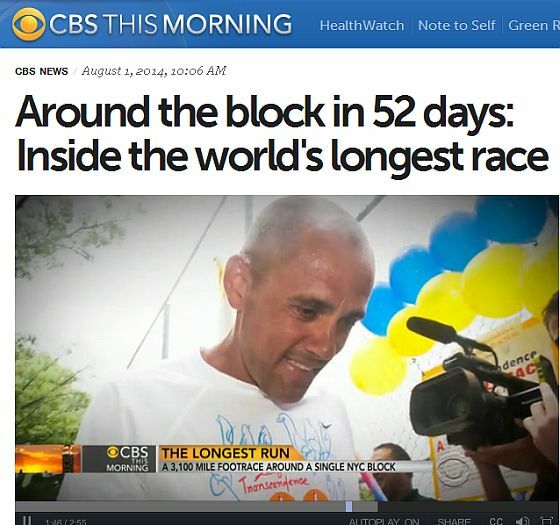 Around the block in 52 days – CBS reports on the 3100 mile race in N.Y.
From left to right: Jayasalini Abramovskikh (RU), Sarah Barnett (AUS), Nidhruvi Zimmerman (A) – still happy after about 36 days of running over 2 marathons (50-60 miles or more) daily! I am particularly impressed, however, by the 3 girls in the race, Sarah from Australia, Nidhruvi from Vienna, Austria, and Jayasalini from Russia – with their absolutely inspiring performances. Having done one 6-day-race myself in April 2010 I have just a small idea of what the runners have to be going through in terms of physical and mental challenges and sometimes excruciating pains – on the one hand. On the other hand, there are many transformative spiritual experiences and deep inner experiences of satisfaction, peace and even ecstasy – which will permeate the entire being and be absorbed and felt #even more for weeks and months after the race is finished. For deeper insights into the world of this mind-blowing challenge there are Utpal’s great daily posts about the race and its runners, with live interviews, photos and very knowledgeble background and inside information on → www.perfectionjourney. Another dream fulfilled! 30 years after I started to run regularly, and with only 24 hours /148 km as my longest running distance so far (injuries always used to prevent me from going further), I finally completed my first multiday race, the 6 day Self-Transcendence Race in New York! With only a few longer runs over the last two months and too much weight due to the long rest after my Channel-triathlon last September, my goals were humble: 1. to stay happy throughout the 6 days of the race, 2. staying in the race until the end, 3. running 300 km (for my 30th anniversary as a member of the Sri Chinmoy Marathon Team and 30 years of meditation practice) and if possilbe at least 50 k/32 miles per day, and 4. to go beyond that, if possible. I am extremely grateful to have achieved all of these 4 goals (213 miles, even skipping the last lap to take photos…). The race was intended as an offering, but all the way I rather felt it was a very special gift and blessing I received. The experience over those 6 days was absolutely amazing – definitely one of my lifetime experiences. In the beginning, the weather reminded very much of Dover: wet, windy, cold. But then we got the whole spectrum – blue skies and scorching sun, showers and torrential rain, even thunderstorms, quiet nights, magical mornings with glittering dew drops everywhere, misty evenings, blossoming trees and flowers, bird concertos, Indian drumming (when you were trying to sleep), playing children on the course, nice chats, comradeship and fun with fellow runners, feelings of elation, bliss, even ecstasy at times – and the feeling to be running on a different planet, protected and carried by a flow of cosmic energy, and yet part of the larger human family. Pains, too, of course – at the end of a set of 10 or 11 miles my feet would be hurting so much I had to take a longer rest, but while resting my legs would hurt so much I could hardly sleep and instead did lots of massaging (with olive and arnica oil and cooling horse cream) and yoga stretching, and applied cabbage bandages to my feet. My heel only flamed up on the last day of the race – at first visualisation helped, then some advil. When the intense pain, like a stabbing knife, came back a few hours later I promised: “If this pain is going to stay with me till the end, I will never do another multiday race again.” And immediately the pain disappeared! I suppose, something inside me wants to come back. First half of day 6 - just finished my 300 k! Even quite early in the race I found myself thinking: next time I should get this, next time I have to do that – part of me seemed already convinced I would come back! My next goals now are to lose considerable weight, which also means more biking, and to be able to enjoy running more, e.g. in the 12 hour race in Berlin in July. No major cold water challenges for the next 1 or 2 years, just the Zurich Lake as usual. 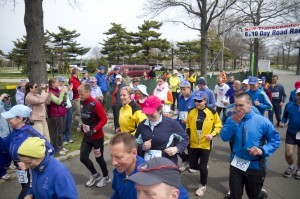 And maybe some self-transcendence in the 6 day race 2012! But the subject of the Cook Straits kept coming up – especially with so many helpers from New Zealand at Dipali’s table on my right (Dipali placed first for the women with 466 miles).